2017.030.5 Nelson, Charlie, Darrel & Dallas Matthews. Matthews family posing in front of their home, Grahams Landing, 1928. 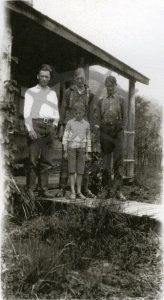 L-R: Nelson Matthews, Charlie Matthews, Darrel Matthews, Dallas Matthews. Photo by parents of Lois Scott.